Soybean gall midge is a relatively new pest that was first noticed in the Midwest in 2011, and can now be found in parts of Iowa, Minnesota, Nebraska and South Dakota. 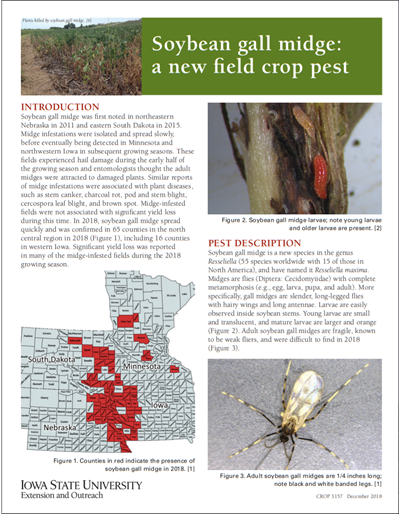 This publication discusses the characteristics of soybean gall midge, how to spot the pest in soybean fields and how they can be managed. Galls are distinctive swellings or abnormal growths of plant tissue caused by an attack of a living organism. 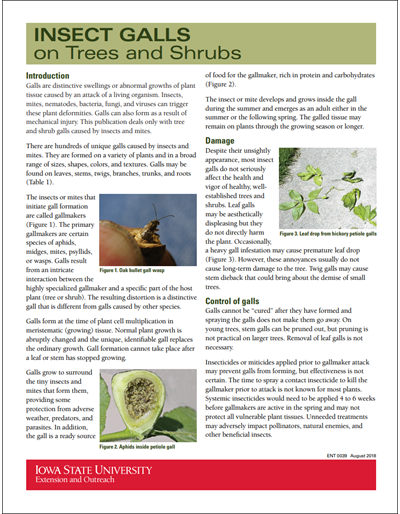 This publication discusses tree and shrub galls caused by insects and mites. It talks about the damage galls create and how they can be controlled. It also provides a detailed list of common galls and gallmarkers that includes color photos. Previously known as IC 0417. This publication is an update of the 1996 version published by the North Central Region. Large quantity discounts (50 and 100 copies+) are available. To inquire, please contact us by email (extstore@iastate.edu) or calling (515)294-5247. 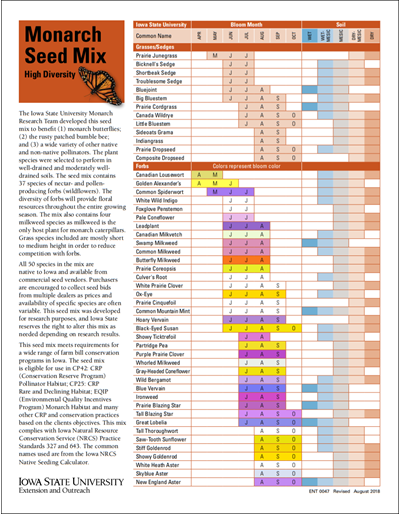 This publication contains a high diversity seed mix developed by the Iowa State University Monarch Research Team for research purposes. All species are perennials native to Iowa. Download and use this form when submitting soil samples for nematode identification and counts. This form is for soybean cyst nematode egg counts, nematodes on corn, turfgrass nematodes, nematodes found in vegetable or fruit crop fields, as well as home gardens. 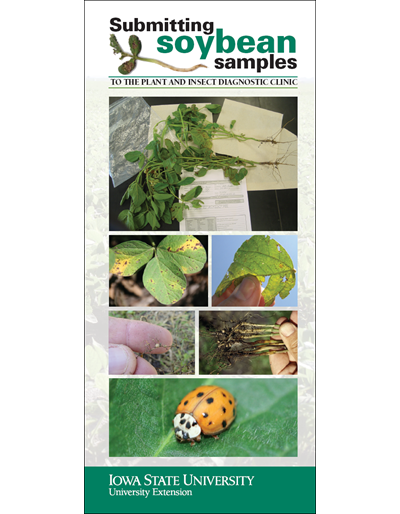 Also includes instructions on collecting and shipping plant and soil samples for nematode analysis at the ISU Plant and Insect Diagnostic Clinic. Download and use this form when submitting a plant problem (plant disease or insects/mites on plants), an insect for identification, a plant for identification, or a mushroom for identification. European corn borer has been a significant pest of Iowa field corn since the 1940s. 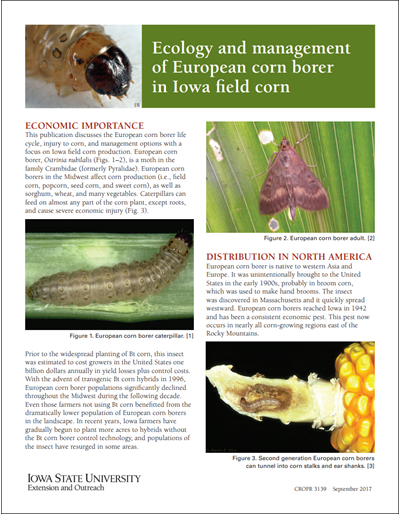 This publication discusses the European corn borer life cycle, injury caused to corn and management options with a focus on Iowa field corn production. Homeowners and commercial pesticide applicators will find control measures to consider in preventing and treating the infestation of ash trees by the emerald ash borer. Includes product recommendations and evaluation of insecticide effectiveness. Ticks can be found across the state of Iowa and are active from March through November. This publication discusses the three most common type of ticks in the state while also providing information on preventing Lyme disease and removing attached ticks. Scale insects are tiny insects that can cause large problems for landscape plants. Despite their small size they can weaken and even kill ornamental plants. 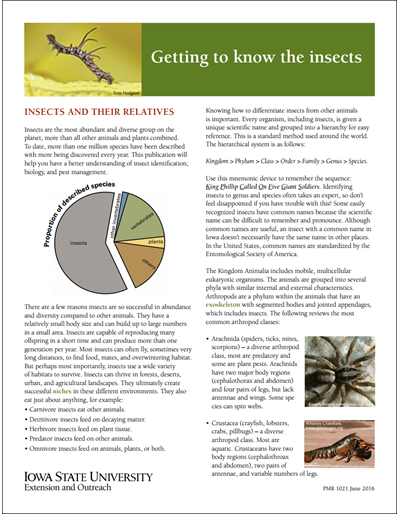 This publication provides information on identifying these insects and steps that can be taken to remove them from plants through biological, mechanical and chemical means. A useful guide to finding certified pesticide applicators who can treat for tree and shrub pests, including the emerald ash borer. 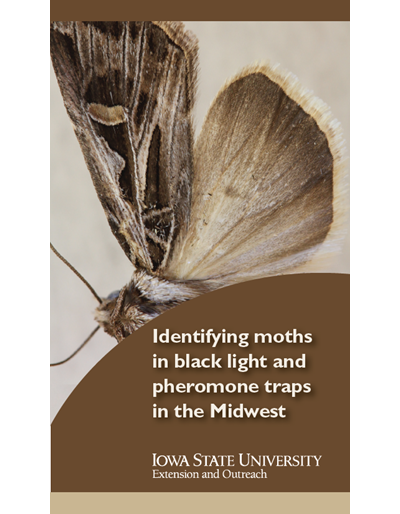 Identifying moths in black light and pheromone traps in the Midwest scouting card is an identification tool for the differentiation of moths which can be caught in various traps. Moths include black cutworm, western bean cutworm, corn earworm, armyworms, and others. 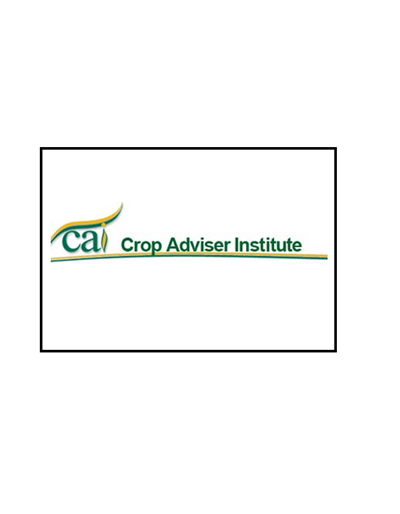 This CD contains full versions of selected Crop Adviser Institute (CAI) learning modules in the Pest Management and Crop Management areas. You will have full access to all materials except the final CEU exam. 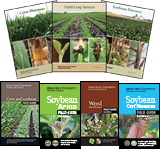 Detailed instructions for submitting soybean plant samples, soybean cyst nematode soil samples, and soybean rust leaf samples. 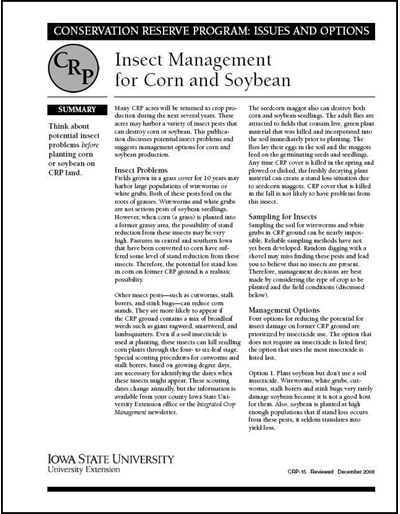 Discusses potential insect problems and suggests management options for corn and soybean production on former CRP acres. April 2008 revision of soybean cyst nematode management recommendations. Few species of spiders and their bites are medically significant to people. 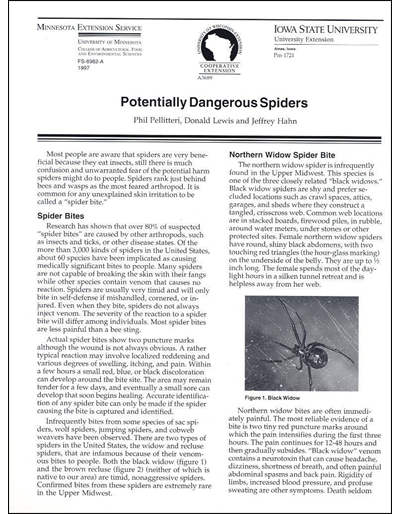 Read about spider bites and potentially dangerous spiders, including the black widow, brown recluse, and sac spiders.